For other uses, see Engine (disambiguation). "Motor" redirects here. For other uses, see Motor (disambiguation). An engine or motor is a machine designed to convert one form of energy into mechanical energy. Heat engines, like the internal combustion engine, burn a fuel to create heat which is then used to do work. Electric motors convert electrical energy into mechanical motion, pneumatic motors use compressed air, and clockwork motors in wind-up toys use elastic energy. In biological systems, molecular motors, like myosins in muscles, use chemical energy to create forces and eventually motion. Motor and engine are interchangeable in standard English. In some engineering jargons, the two words have different meanings, in which engine is a device that burns or otherwise consumes fuel, changing its chemical composition, and a motor is a device driven by electricity, air, or hydraulic pressure, which does not change the chemical composition of its energy source. However, rocketry uses the term rocket motor, even though they consume fuel. Simple machines, such as the club and oar (examples of the lever), are prehistoric. More complex engines using human power, animal power, water power, wind power and even steam power date back to antiquity. Human power was focused by the use of simple engines, such as the capstan, windlass or treadmill, and with ropes, pulleys, and block and tackle arrangements; this power was transmitted usually with the forces multiplied and the speed reduced. These were used in cranes and aboard ships in Ancient Greece, as well as in mines, water pumps and siege engines in Ancient Rome. The writers of those times, including Vitruvius, Frontinus and Pliny the Elder, treat these engines as commonplace, so their invention may be more ancient. By the 1st century AD, cattle and horses were used in mills, driving machines similar to those powered by humans in earlier times. According to Strabo, a water powered mill was built in Kaberia of the kingdom of Mithridates during the 1st century BC. Use of water wheels in mills spread throughout the Roman Empire over the next few centuries. Some were quite complex, with aqueducts, dams, and sluices to maintain and channel the water, along with systems of gears, or toothed-wheels made of wood and metal to regulate the speed of rotation. More sophisticated small devices, such as the Antikythera Mechanism used complex trains of gears and dials to act as calendars or predict astronomical events. In a poem by Ausonius in the 4th century AD, he mentions a stone-cutting saw powered by water. Hero of Alexandria is credited with many such wind and steam powered machines in the 1st century AD, including the Aeolipile and the vending machine, often these machines were associated with worship, such as animated altars and automated temple doors. Medieval Muslim engineers employed gears in mills and water-raising machines, and used dams as a source of water power to provide additional power to watermills and water-raising machines. In the medieval Islamic world, such advances made it possible to mechanize many industrial tasks previously carried out by manual labour. In 1206, al-Jazari employed a crank-conrod system for two of his water-raising machines. A rudimentary steam turbine device was described by Taqi al-Din in 1551 and by Giovanni Branca in 1629. In the 13th century, the solid rocket motor was invented in China. Driven by gunpowder, this simplest form of internal combustion engine was unable to deliver sustained power, but was useful for propelling weaponry at high speeds towards enemies in battle and for fireworks. After invention, this innovation spread throughout Europe. 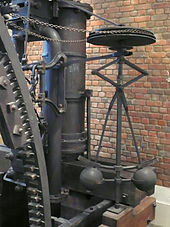 The Watt steam engine was the first type of steam engine to make use of steam at a pressure just above atmospheric to drive the piston helped by a partial vacuum. Improving on the design of the 1712 Newcomen steam engine, the Watt steam engine, developed sporadically from 1763 to 1775, was a great step in the development of the steam engine. Offering a dramatic increase in fuel efficiency, James Watt's design became synonymous with steam engines, due in no small part to his business partner, Matthew Boulton. It enabled rapid development of efficient semi-automated factories on a previously unimaginable scale in places where waterpower was not available. Later development led to steam locomotives and great expansion of railway transportation. As for internal combustion piston engines, these were tested in France in 1807 by de Rivaz and independently, by the Niépce brothers. They were theoretically advanced by Carnot in 1824. In 1853–57 Eugenio Barsanti and Felice Matteucci invented and patented an engine using the free-piston principle that was possibly the first 4-cycle engine. The invention of an internal combustion engine which was later commercially successful was made during 1860 by Etienne Lenoir. In 1877 the Otto cycle was capable of giving a far higher power to weight ratio than steam engines and worked much better for many transportation applications such as cars and aircraft. The first commercially successful automobile, created by Karl Benz, added to the interest in light and powerful engines. The lightweight petrol internal combustion engine, operating on a four-stroke Otto cycle, has been the most successful for light automobiles, while the more efficient Diesel engine is used for trucks and buses. However, in recent years, turbo Diesel engines have become increasingly popular, especially outside of the United States, even for quite small cars. In 1896, Karl Benz was granted a patent for his design of the first engine with horizontally opposed pistons. His design created an engine in which the corresponding pistons move in horizontal cylinders and reach top dead center simultaneously, thus automatically balancing each other with respect to their individual momentum. Engines of this design are often referred to as flat engines because of their shape and lower profile. They were used in the Volkswagen Beetle, the Citroën 2CV, some Porsche and Subaru cars, many BMW and Honda motorcycles, and propeller aircraft engines. x pollution, than gasoline engines. Diesel engines are also 40% more fuel efficient than comparable gasoline engines. In the first half of the 20th century, a trend of increasing engine power occurred, particularly in the American models. [clarification needed] Design changes incorporated all known methods of raising engine capacity, including increasing the pressure in the cylinders to improve efficiency, increasing the size of the engine, and increasing the rate at which the engine produces work. The higher forces and pressures created by these changes created engine vibration and size problems that led to stiffer, more compact engines with V and opposed cylinder layouts replacing longer straight-line arrangements. Earlier automobile engine development produced a much larger range of engines than is in common use today. Engines have ranged from 1- to 16-cylinder designs with corresponding differences in overall size, weight, engine displacement, and cylinder bores. Four cylinders and power ratings from 19 to 120 hp (14 to 90 kW) were followed in a majority of the models. Several three-cylinder, two-stroke-cycle models were built while most engines had straight or in-line cylinders. There were several V-type models and horizontally opposed two- and four-cylinder makes too. Overhead camshafts were frequently employed. The smaller engines were commonly air-cooled and located at the rear of the vehicle; compression ratios were relatively low. The 1970s and 1980s saw an increased interest in improved fuel economy, which caused a return to smaller V-6 and four-cylinder layouts, with as many as five valves per cylinder to improve efficiency. The Bugatti Veyron 16.4 operates with a W16 engine, meaning that two V8 cylinder layouts are positioned next to each other to create the W shape sharing the same crankshaft. The largest internal combustion engine ever built is the Wärtsilä-Sulzer RTA96-C, a 14-cylinder, 2-stroke turbocharged diesel engine that was designed to power the Emma Mærsk, the largest container ship in the world when launched in 2006. This engine has a mass of 2,300 tonnes, and when running at 102 RPM (1.7 Hz) produces over 80 MW, and can use up to 250 tonnes of fuel per day. Combustion engines are heat engines driven by the heat of a combustion process. The internal combustion engine is an engine in which the combustion of a fuel (generally, fossil fuel) occurs with an oxidizer (usually air) in a combustion chamber. In an internal combustion engine the expansion of the high temperature and high pressure gases, which are produced by the combustion, directly applies force to components of the engine, such as the pistons or turbine blades or a nozzle, and by moving it over a distance, generates mechanical work. An external combustion engine (EC engine) is a heat engine where an internal working fluid is heated by combustion of an external source, through the engine wall or a heat exchanger. The fluid then, by expanding and acting on the mechanism of the engine produces motion and usable work. The fluid is then cooled, compressed and reused (closed cycle), or (less commonly) dumped, and cool fluid pulled in (open cycle air engine). "Combustion" refers to burning fuel with an oxidizer, to supply the heat. Engines of similar (or even identical) configuration and operation may use a supply of heat from other sources such as nuclear, solar, geothermal or exothermic reactions not involving combustion; but are not then strictly classed as external combustion engines, but as external thermal engines. The working fluid can be a gas as in a Stirling engine, or steam as in a steam engine or an organic liquid such as n-pentane in an Organic Rankine cycle. The fluid can be of any composition; gas is by far the most common, although even single-phase liquid is sometimes used. In the case of the steam engine, the fluid changes phases between liquid and gas. Air-breathing combustion engines are combustion engines that use the oxygen in atmospheric air to oxidise ('burn') the fuel, rather than carrying an oxidiser, as in a rocket. Theoretically, this should result in a better specific impulse than for rocket engines. A continuous stream of air flows through the air-breathing engine. This air is compressed, mixed with fuel, ignited and expelled as the exhaust gas. Liquid air cycle engine/Reaction Engines SABRE. The operation of engines typically has a negative impact upon air quality and ambient sound levels. There has been a growing emphasis on the pollution producing features of automotive power systems. This has created new interest in alternate power sources and internal-combustion engine refinements. Though a few limited-production battery-powered electric vehicles have appeared, they have not proved competitive owing to costs and operating characteristics. In the 21st century the diesel engine has been increasing in popularity with automobile owners. However, the gasoline engine and the Diesel engine, with their new emission-control devices to improve emission performance, have not yet been significantly challenged. A number of manufacturers have introduced hybrid engines, mainly involving a small gasoline engine coupled with an electric motor and with a large battery bank, but these too have yet to make much of an inroad into the market shares of gasoline and Diesel engines. Exhaust from a spark ignition engine consists of the following: nitrogen 70 to 75% (by volume), water vapor 10 to 12%, carbon dioxide 10 to 13.5%, hydrogen 0.5 to 2%, oxygen 0.2 to 2%, carbon monoxide: 0.1 to 6%, unburnt hydrocarbons and partial oxidation products (e.g. aldehydes) 0.5 to 1%, nitrogen monoxide 0.01 to 0.4%, nitrous oxide <100 ppm, sulfur dioxide 15 to 60 ppm, traces of other compounds such as fuel additives and lubricants, also halogen and metallic compounds, and other particles. Carbon monoxide is highly toxic, and can cause carbon monoxide poisoning, so it is important to avoid any build-up of the gas in a confined space. Catalytic converters can reduce toxic emissions, but not completely eliminate them. Also, resulting greenhouse gas emissions, chiefly carbon dioxide, from the widespread use of engines in the modern industrialized world is contributing to the global greenhouse effect – a primary concern regarding global warming. Some engines convert heat from noncombustive processes into mechanical work, for example a nuclear power plant uses the heat from the nuclear reaction to produce steam and drive a steam engine, or a gas turbine in a rocket engine may be driven by decomposing hydrogen peroxide. Apart from the different energy source, the engine is often engineered much the same as an internal or external combustion engine. Another group of noncombustive engines includes thermoacoustic heat engines (sometimes called "TA engines") which are thermoacoustic devices which use high-amplitude sound waves to pump heat from one place to another, or conversely use a heat difference to induce high-amplitude sound waves. In general, thermoacoustic engines can be divided into standing wave and travelling wave devices. An electric motor uses electrical energy to produce mechanical energy, usually through the interaction of magnetic fields and current-carrying conductors. The reverse process, producing electrical energy from mechanical energy, is accomplished by a generator or dynamo. Traction motors used on vehicles often perform both tasks. Electric motors can be run as generators and vice versa, although this is not always practical. Electric motors are ubiquitous, being found in applications as diverse as industrial fans, blowers and pumps, machine tools, household appliances, power tools, and disk drives. They may be powered by direct current (for example a battery powered portable device or motor vehicle), or by alternating current from a central electrical distribution grid. The smallest motors may be found in electric wristwatches. Medium-size motors of highly standardized dimensions and characteristics provide convenient mechanical power for industrial uses. The very largest electric motors are used for propulsion of large ships, and for such purposes as pipeline compressors, with ratings in the thousands of kilowatts. Electric motors may be classified by the source of electric power, by their internal construction, and by their application. The physical principle of production of mechanical force by the interactions of an electric current and a magnetic field was known as early as 1821. Electric motors of increasing efficiency were constructed throughout the 19th century, but commercial exploitation of electric motors on a large scale required efficient electrical generators and electrical distribution networks. By convention, electric engine refers to a railroad electric locomotive, rather than an electric motor. Some motors are powered by potential or kinetic energy, for example some funiculars, gravity plane and ropeway conveyors have used the energy from moving water or rocks, and some clocks have a weight that falls under gravity. Other forms of potential energy include compressed gases (such as pneumatic motors), springs (clockwork motors) and elastic bands. Historic military siege engines included large catapults, trebuchets, and (to some extent) battering rams were powered by potential energy. A pneumatic motor is a machine that converts potential energy in the form of compressed air into mechanical work. Pneumatic motors generally convert the compressed air to mechanical work though either linear or rotary motion. Linear motion can come from either a diaphragm or piston actuator, while rotary motion is supplied by either a vane type air motor or piston air motor. Pneumatic motors have found widespread success in the hand-held tool industry and continual attempts are being made to expand their use to the transportation industry. However, pneumatic motors must overcome efficiency deficiencies before being seen as a viable option in the transportation industry. A hydraulic motor is one that derives its power from a pressurized fluid. This type of engine can be used to move heavy loads or produce motion. Given that the majority of engines for which a speed is defined rotate, engine speed is measured in revolutions per minute (RPM). Engines may be classified as low-speed, medium-speed or high-speed, but these terms are always relative and depend on the type of engine being described. Generally, diesel engines operate at lower speeds (~1500–4000 RPM for an automotive diesel) compared to gasoline engines (~2200–6000 RPM for an automotive gasoline engine). Electric motors and turboshafts are capable of very high speeds (~10,000 RPM or more), generally constrained only by the bulk modulus and intended service life of the parts constituting the rotor, which must bear the brunt of the centrifugal force. Thrust is the force arising from the interaction between two masses which exert equal but opposite forces on each other due to their speed. The force F can be measured either in newtons (N, SI units) or more rarely in pounds-thrust (lbf, imperial units). where r is the length of the lever, F is the force applied on it, and r×F is the vector cross product. Torque is typically measured in newton-metres (N·m, SI units) and a few countries use the older foot-pounds (ft·lb, imperial units). This formula with linear forces and speeds can be used equally well for both engines outputting thrust and engines exerting torque. When considering propulsive engines, typically only the raw force of the core mass flow is considered, leading to such engines having their 'power' rated in any of the units discussed above for forces. This is the reason why any engine outputting its power on a rotating shaft is usually quoted, along with its rated power, the rotational speed at which that rated power is developed. Depending on the type of engine employed, different rates of efficiency are attained. For heat engines, efficiency cannot be greater than the Carnot efficiency. In the case of sound levels, engine operation is of greatest impact with respect to mobile sources such as automobiles and trucks. Engine noise is a particularly large component of mobile source noise for vehicles operating at lower speeds, where aerodynamic and tire noise is less significant. Generally speaking, petrol (gasoline) and diesel engines emit less noise than turboshafts of equivalent power output; electric motors very often emit less noise than their fossil fuel-powered equivalents. Thrust-outputting engines, such as turbofans, turbojets and rockets emit the greatest amount of noise because their method of producing thrust is directly related to the production of sound. Various methods have been devised to reduce noise. Petrol and diesel engines are fitted with mufflers (silencers); newer turbofans often have outsized fans (the so-called high-bypass technology) in order to reduce the proportion of noisy, hot exhaust from the integrated turboshaft in the exhaust stream, and hushkits exist for older, low-bypass turbofans. No known methods exist for reducing the noise output of rockets without a corresponding reduction in thrust. Non-road engine is the term used to define engines that are not used by vehicles on roadways. ^ "Motor". Dictionary.reference.com. Retrieved 2011-05-09. a person or thing that imparts motion, esp. a contrivance, as a steam engine, that receives and modifies energy from some source in order to utilize it in driving machinery. ^ Dictionary.com: (World heritage) "3. any device that converts another form of energy into mechanical energy so as to produce motion"
^ "Engine". Collins English Dictionary. Retrieved 2012-09-03. "motor". Dictionary.com Unabridged. Random House. "engine". Dictionary.com Unabridged. Random House. ^ "Engine", McGraw-Hill Concise Encyclopedia of Science and Technology, Third Edition, Sybil P. Parker, ed. McGraw-Hill, Inc., 1994, p. 714. ^ Quinion, Michael. "World Wide Words: Engine and Motor". Worldwide Words. Retrieved 2018-02-03. ^ "Prime mover", McGraw-Hill Concise Encyclopedia of Science and Technology, Third Edition, Sybil P. Parker, ed. McGraw-Hill, Inc., 1994, p. 1498. ^ Press, AIP, Associated (2007). Stylebook and Briefing on Media Law (42nd ed.). New York: Basic Books. p. 84. ISBN 978-0-465-00489-8. ^ Hassan, Ahmad Y. Transmission Of Islamic Engineering. Transfer Of Islamic Technology To The West, Part II. Archived from the original on 2008-02-18. ^ Hassan, Ahmad Y. (1976). Taqi al-Din and Arabic Mechanical Engineering, pp. 34–35. Institute for the History of Arabic Science, University of Aleppo. ^ "University of Rochester, NY, The growth of the steam engine online history resource, chapter one". History.rochester.edu. Archived from the original on 2012-02-04. Retrieved 2010-02-03. ^ "La documentazione essenziale per l'attribuzione della scoperta". A later request was presented to the Patent Office of the Reign of Piedmont, under No. 700 of Volume VII of that Office. The text of this patent request is not available, only a photo of the table containing a drawing of the engine. This may have been either a new patent or an extension of a patent granted three days earlier, on 30 December 1857, at Turin. ^ Proctor II, Charles Lafayette. "Internal Combustion engines". Encyclopædia Britannica Online. Retrieved 2011-05-09. ^ "Internal combustion engine". Answers.com. Retrieved 2011-05-09. ^ "Columbia encyclopedia: Internal combustion engine". Inventors.about.com. Archived from the original on 2012-07-21. Retrieved 2011-05-09. ^ "Internal-combustion engine". Infoplease.com. 2007. Retrieved 2011-05-09. ^ "External combustion". Merriam-Webster Online Dictionary. 2010-08-13. Retrieved 2011-05-09. ^ Azuma, Tsukasa (2014-12-01). "Types Of Car Engines – Everything You Wanted To Know". Car From Japan. Retrieved 2018-02-04. ^ Emam, Mahmoud (2013). Experimental Investigations on a Standing-Wave Thermoacoustic Engine, M.Sc. Thesis. Egypt: Cairo University. Retrieved 2013-09-26. ^ "Howstuffworks "Engineering"". Reference.howstuffworks.com. 2006-01-29. Archived from the original on 2009-08-21. Retrieved 2011-05-09. ^ Hogan, C. Michael (September 1973). "Analysis of Highway Noise". Journal of Water, Air, and Soil Pollution. 2 (3): 387–92. ISSN 0049-6979. Retrieved 2011-05-09. Wikimedia Commons has media related to Engines. Look up engine in Wiktionary, the free dictionary.